The leaves of most healthy trees in this area are a medium-dark, lush green, but Pin Oaks, White Oaks and River Birches can turn varying shades of yellow-green or yellow. It can be obvious and may be symptomatic of a disease known as iron chlorosis. 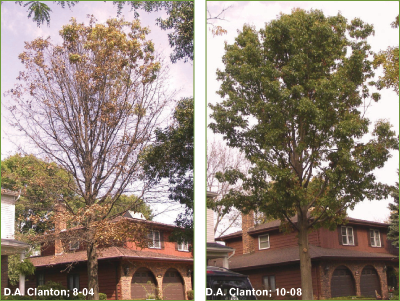 If left untreated long enough it will lead to an eventual browning, loss of the leaves, and death of the tree. 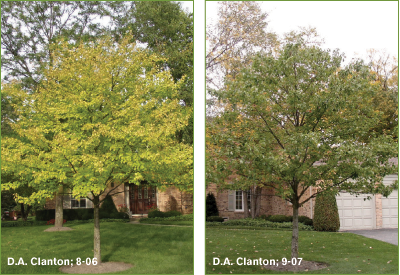 Red and Silver Maples suffer iron/manganese chlorosis with symptoms similar to iron chlorosis and consequences just as serious. Pin Oaks are known for this problem, but so are River Birches and increasingly Red Maples (which are supposed to be green most of the season). 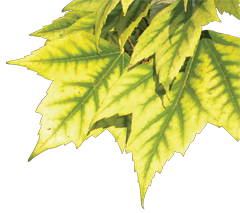 Chlorosis of this type causes yellowing with a ‘veining’ pattern on the leaves at an early stage, whereas the veins of the leaves are darker than the leaf tissue between. In the later stage the leaf turns completely yellow before it dies and turns brown. Short of death, a chlorotic tree may suffer permanent limb loss, but if treated properly and timely will live a normal, healthy life. River Birches are often victims of poor site placement and extremely susceptible to dehydration. Within a couple weeks without water their leaves may turn a consistent shade of yellow and fall off. Dehydration may exacerbate iron chlorosis but is otherwise unrelated, as onset of iron chlorosis usually takes years. This is unrelated to iron chlorosis but may occur simultaneously. Because most Pin Oaks, River Birches, and Red and Silver Maples were originally transplanted from a nursery doesn’t mean they aren’t native to this area. They are. Many older White and Red Oaks may be survivors of the original forest. So after thousands of years why are these trees having trouble now? In a word it is "development," all over (and under) your property in the form of concrete, limestone and disturbed soil. In all or in part, concrete constitutes the house foundation, driveway and sidewalks, streets and curbs. Worse than concrete though out of sight is limestone—that white, chalky crushed rock used routinely as fill for excavations and long-forgotten trenches, and base for concrete and asphalt pavement. These materials are alkaline in pH value, and where in contact with soil raise the pH. High pH restricts natural-occurring iron and manganese in the soil from being uptaken by the roots of these certain tree types. Without iron or manganese, synthesis of chlorophyll (green) is prevented, thus yellowing the leaves. This is known as the "lime inducement" cause of chlorosis. A more recent study indicates iron chlorosis may also be caused by poor soil and rooting conditions regardless of pH. The cause in either case has everything to do with unnatural growing conditions caused by urban development. Whatever the exact cause of iron and manganese chlorosis, one thing is certain: it is a nutrient deficiency corrected with supplementation of iron or manganese. Under most circumstances this is best done by a process known as "macro-infusion." There are other supplementation procedures, but only macro-infusion can deliver these missing nutrients in quantities ample enough to correct the problem entirely for medium-size and large trees. Periodic treatment every three to five years is typically required. Except for Red Maples, iron/manganese chlorosis doesn’t usually affect smaller trees. 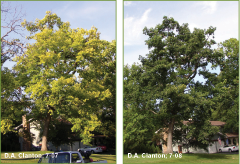 But when these certain tree types become larger this micro-nutrient deficiency often becomes a problem of chlorosis, requiring periodic supplementation. 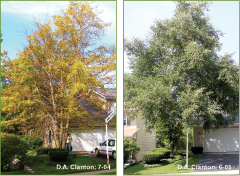 Yellowed, chlorotic trees pictured here suffered severe damage before treatments took effect. This damage should be avoided with treatment at an earlier stage when leaf color is light green! Best time to macro-infuse supplements of iron or manganese for chlorosis is in the fall. will live a normal, healthy life. Two other tree services wanted to cut this Pin Oak down in Glen Ellyn in 2004, but Dave Clanton said "No way!" Right photo October 2008. Click on photo to enlarge. River Birch in Downers Grove before and a year after treatment. Click the photo to enlarge. White Oaks on this Gurnee property were already lost to iron chlorosis and decline. Click on photo to enlarge. Iron-Manganese Chlorosis on a Red Maple located in Lincolnshire, before and one year after treatment. Click on photo to enlarge.